Skip the routine treadmill and bench press and opt for this fun new workout instead that’ll have you suspended from a bungee cord with your feet off the ground. Sounds exciting, doesn’t it? When it comes to fitness, it’s always a good idea to switch things up and keep it interesting. And if you think you’ve tried every other kind of fitness workout in the book, think again. Apparently happening in India for the first time, fitness and wellness space Dhurii is bringing BungFly to town. What is BungFly, you ask? It’s a fun workout that involves you being harnessed to a bungee cord hanging from the ceiling. Get your whole body working and your cardio out of the way with this new aerial workout that’s great for basically anyone. Originating in Bangkok, this kind of workout blends dance, fitness and acrobatics, with resistance against the ropes that keep pulling you upwards. The idea behind this kind of workout is to keep the pressure off the knee joints and works on cardio and core. The legs also get a solid workout because you need to keep the rope pulling downwards. Dhurii is conducting frequent BungFly workshops at Ben Body Studio in Indiranagar and Fit District in Koramangala. You can attend these workshops for just INR 500. But they only have five spots open for each workshop. So hurry and sign yourself up for BungFly here. Check their Facebook page here to know when the next workout is scheduled. The BungFly claims to work every part of your body, and the resistance that the bungee cord creates should have you fighting fit with every passing session. 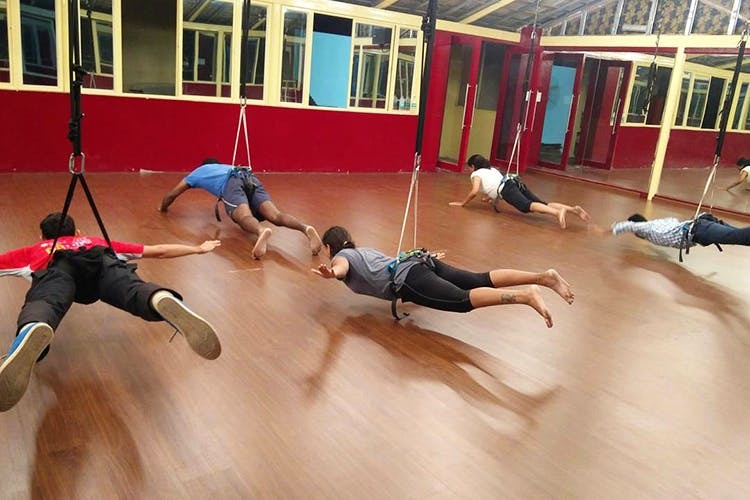 Although at the moment, they’re only conducting workshops, regular classes are likely to commence soon, so keep a close eye on that and get attached to a bungee and fly your way to fitness. You can book a session on their website.